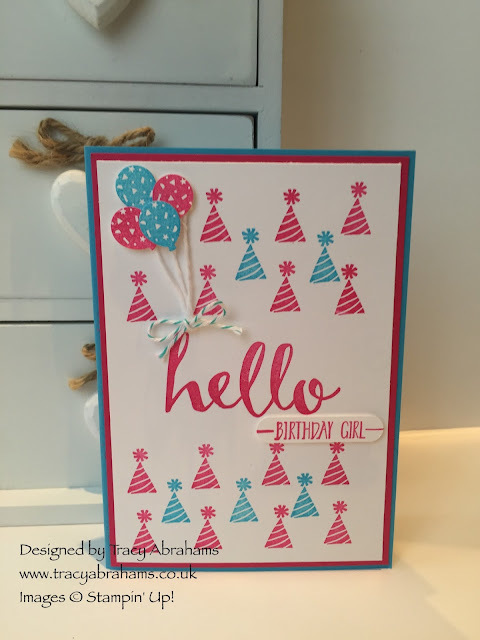 I love this set and I've used it to make lots of lovely cards and one of the cards is this great birthday card for a special young lady. It's such a great little set and so useful. This card is made using Melon Mambo and Tempting Turquoise Ink and card stock. I also used the little balloon punch from the Party Punch Pack. Plus some White and Bermuda Bay bakers twine and hay presto it was done in just a a few minutes. There are some other great offers on during Sale-a-bration including a great joining offer, this is such a great offer and gives you £160 crafting products for just £99 that's an extra £61!!! Just click on the picture above and it will take you straight to my online web site and the joining page where you can get started. All you have to do is pick your £160 worth of products and you can begin to take your first steps on your craft journey. There is so many other benefits of being part of the Stampin' Up! family there's the friendship the many different social activities you can be part of and the best bit is the discount you get on all your crafting products. I have included the items I have used below, if you would like to purchase anything please click on the coordinating picture. If you do make a purchase please use my Hostess Code ZMGUYXAP and I will send you out a lovely gift and card for using my code. Please tick the I would like contact section as I am not allowed by law to send out a gift otherwise. 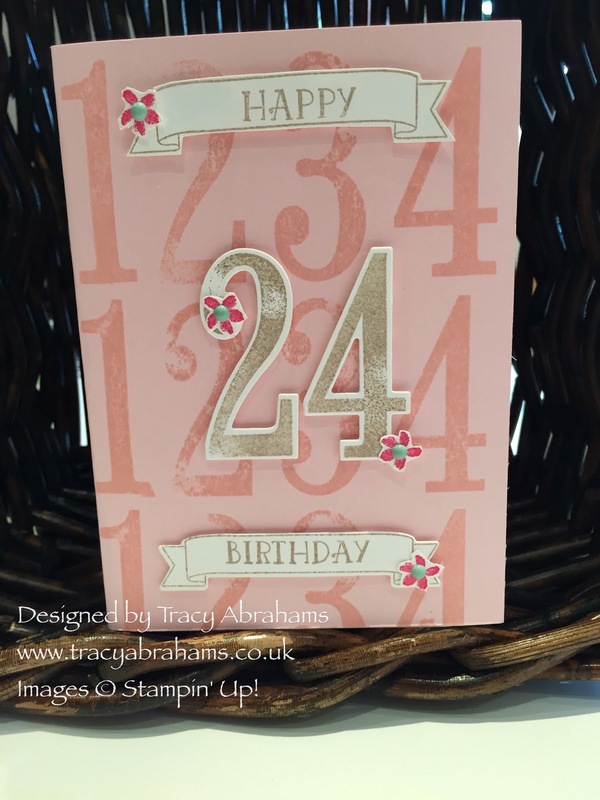 Birthday Cards using Birthday Wishes Stamp Set by Stampin' Up! I'm really in love with the New Spring/Summer Stampin' Up! Catalogue there's so many lovely stamp sets and I'm itching to use them all. The first one I used for a recent class I held was the Party Wishes bundle, it's just too cute, and the fact that it's got 3 coordinating punches just makes it even more of a must have. 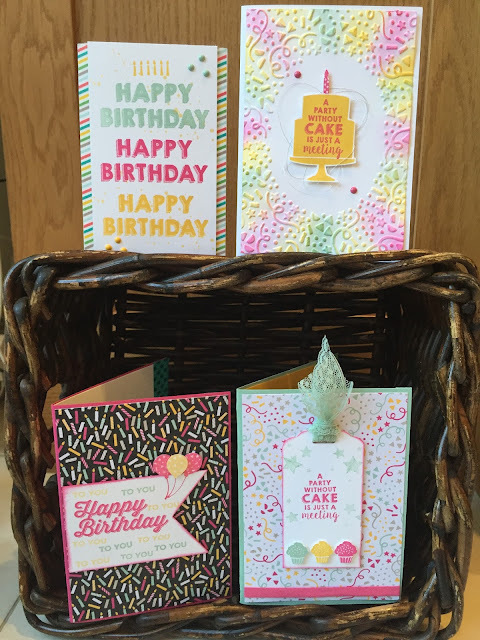 The bundle comes in the New Spring/Summer Catalogue and as you can see the stamp set is very versatile and it can be used to make a lot of different cards. We also used the super cute It's My Party Designer Series Paper which has 48 sheets of 12 double sided 12" x 12" papers. If you were to buy the Party Wishes Bundle with a saving of 15% and the Designer Series Paper they would cost you £51 together which would mean you would recieve one FREE item from the Sale-a-bration Catalogue. You can choose items from both the Annual and Sesonal Catalogues and you will recieve Sale-A-Bration FREEBIES. or you could have the Party Wishes Bundle, Designer Series paper, co-ordinating inks, paper and lots more and you could choose this offer for just £99. It's such a great time to join my team and get a great discount on some fabulous crafting products If you are interested in joining my team please click on the picture above which will take you straight to my online web site/page. If you would like to join my team I would be happy to support you in whatever way you need, or if you just want to take advantage of this fabulous offer for the extra £61 worth of crafting products that's fine too. You would have the same great advantages as any Stampin' Up! 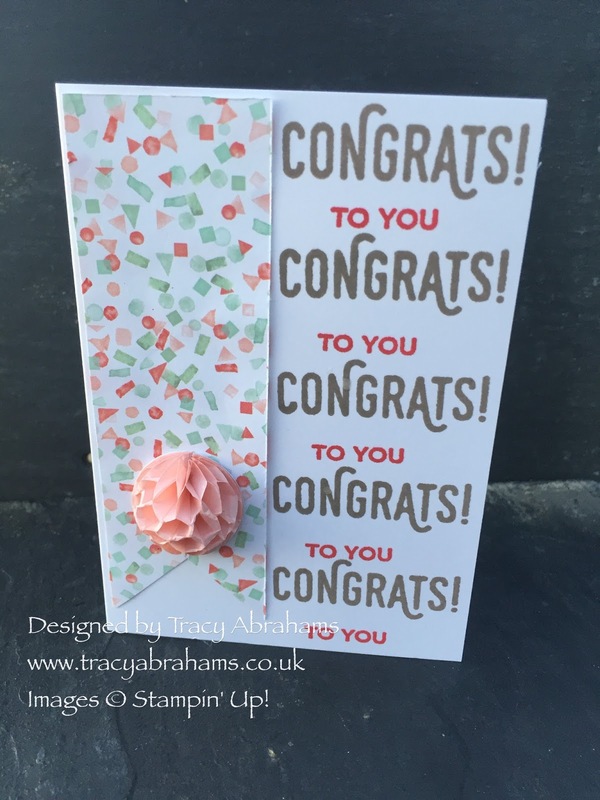 demonstrator for a full 4 months to start with and then for however long you choose to continue with Stampin' Up! I also wanted to take a moment to apologise as I have had computer problems and haven't been able to blog for well over a week, hopefully that is all sorted now and i will be bringing you lots of new and exciting projects that i have been working on. If you would like to purchase anything i have used to make these fab cards the items are below so click on the item and it will take you straight to the correct page where you can view that item. If you do make a purchase please use my HOSTESS CODE ZMGUYXAP and i will send you out a free stampin up gift sent from me. Please also tick the i would like contact section so I know where to send the gift to. 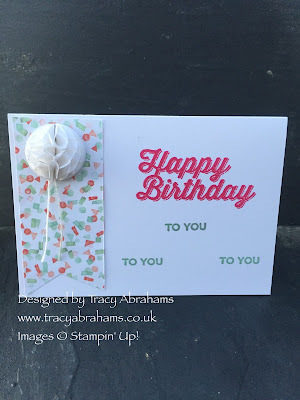 I'm having such a great time making super cute cards with all the lovely Free products from the Sale-A-Bration Catalogue and I wanted to share some of them with you today, and over the coming weeks I will be sharing lots more. 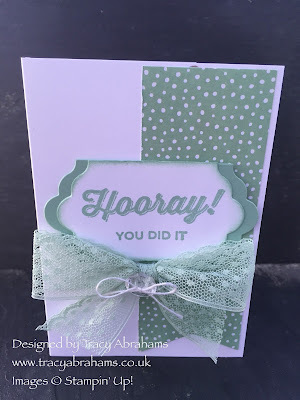 Above are all the sentiments that come in the Stamp set it's such a versatile set and I love it !! 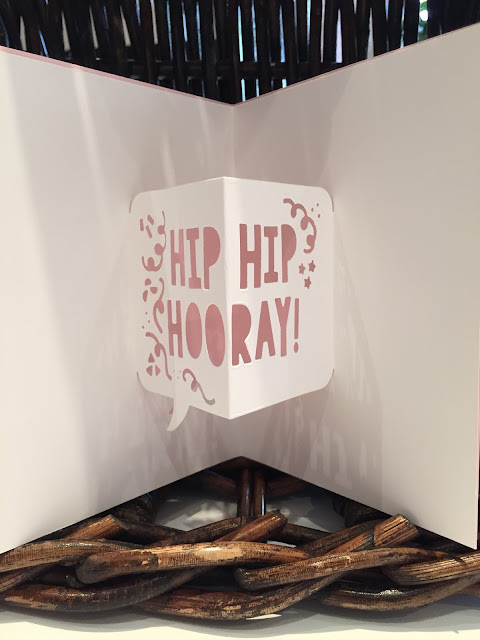 and did I say it's Free, when you take advantage of the deals from Stampin' Up! while stocking up on all your basic crafting products from the Annual and Seasonal catalogues. It's one of the best offers all year. Ohhh don't they look lovely and the paper is so pretty it's from the Spring/Summer catalogue and it's called Birthday Bouquet DSP, I used just a little bit and some of the little Honeycomb Embellishments. This time of year is a great time so why not take advantage of all the offers available. Join my team and be part of this great organisation or just purchase the starter kit for the products either way you get £160 worth of products for £99 which is a great way to start your crafting journey. It's easy just click on the picture or click on the side of this page and go straight on to the website to the signing up page, it's that easy and your products will be with you in just a few days,. ohh how exciting!!! . whichever way suits you I'm here just let me know how I can help. All the items used are below and remember when you make a purchase to use my hostess code ZMGUYXAP if your spend is between £20 - £150 and I will send you out a gift from me separately. You will receive your Sale-A-Bration FREE goodies but don't worry the website will prompt you and tell you how many you have earned. Labels: Birthday Bouquet DSP, Honeycomb Embellishments, New Spring/Summer Catalogue, Sale-A-Bratioin Catalogue, stampin' up! Gosh 2015 was a busy year with lots of Stampin' Up! fun class and activities. I did a class a month and was very lucky as I had some lovely ladies that attended, here's what we made at the classes. The ladies that come are all ages and everyone that comes, be it a beginners or a more advanced crafter gets a lot out of the evening. We mostly spend the evening chatting and laughing with cake and tea thrown in for good measure. The ladies go home having had a great evening with lots of lovely cards to send to friends and family. It was also an exciting year as in September my daughter went off on her gap year which for me is a bit sad as she is the youngest of 3 so my my baby so to speak, but great for her as she is doing what she wants to do and volunteering and helping other communities abroad. 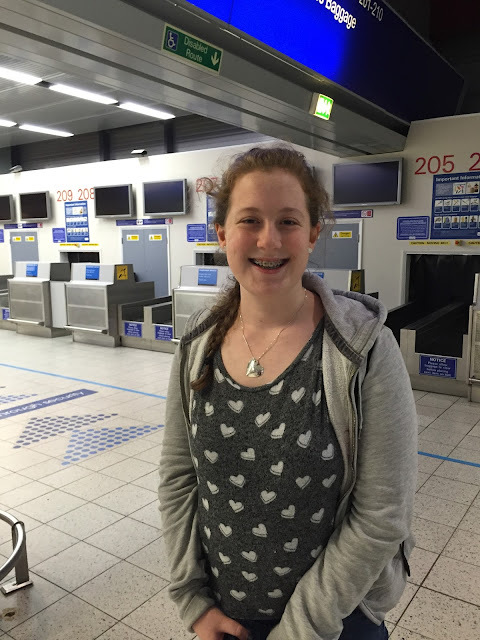 Here's Gabriella at the airport just about to leave for her travels. 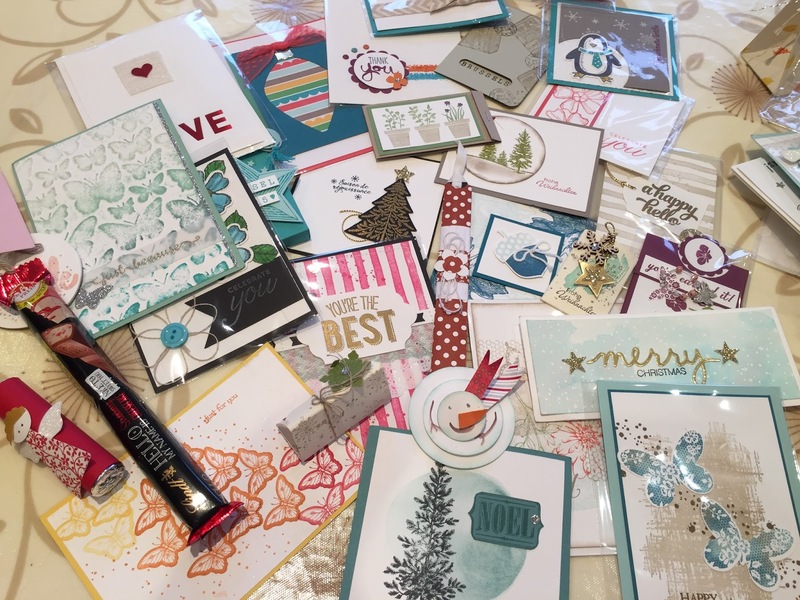 In November I attended a great Stampin' Up! event in Brussels where all the demonstrators from around the world meet up and share swaps and projects and learn about new products and items in the upcoming catalogue. The latest catalogue is available from today 5th January with loads of lovely new stamp sets and super cute dies and punches. 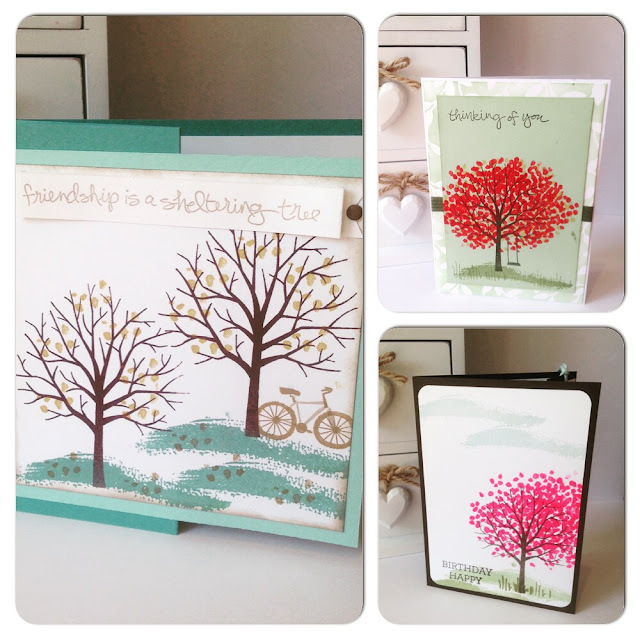 It's such a great time of year as along with this catalogue there's the Stampin' Up! 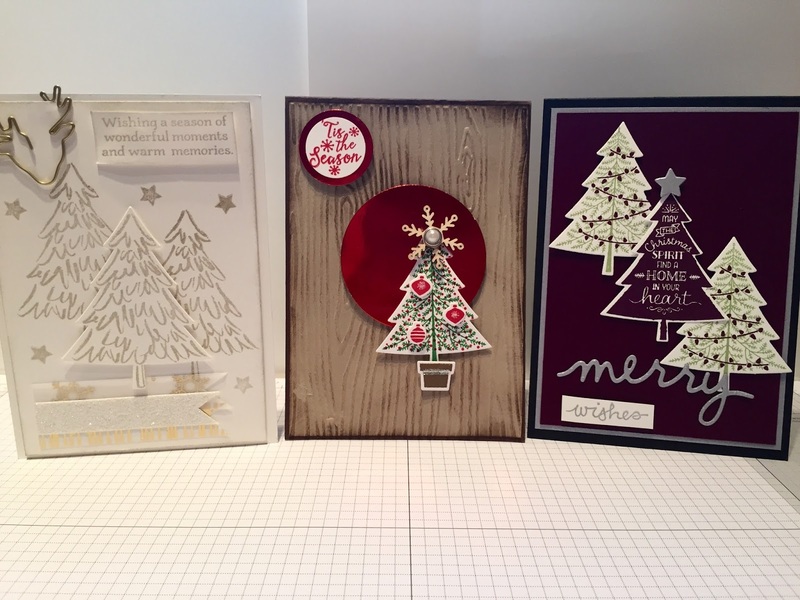 Sale-A-Bration event which is the best time of year if you love craft supplies and goodies as for every £45 spend you receive a FREE product. Click on the links highlighted to take a look at the catalogues. It was such a busy year and it flew by as I love what I do, be it holding classes for beginners or the young or more mature ladies or people with health problems or disabilities, because everything seems to be forgotten for just a few hours while everyone enjoys crafting together. I feel very happy to do what I do as a job and bring so much pleasure to people of all ages and on top of that I get share what I love and use the best craft products on the market. Thank you for reading my blog I hope you have enjoyed looking back with me today and I look forward to bring you lots of lovely cards and projects from the new Spring/Summer 2016 Stampin' Up! Catalogue in 2016. Labels: New Spring/Summer Catalogue, Sale-A-Bratioin Catalogue, stampin' up! I'm really loving the Number of Years Stamp Set from the new 2016 Spring/Summer Catalogue. It's such a great stamp set and I can't put it down.... really !! There's so many possibilities with this stamp set and the size makes it a super cute stamp set to work with. 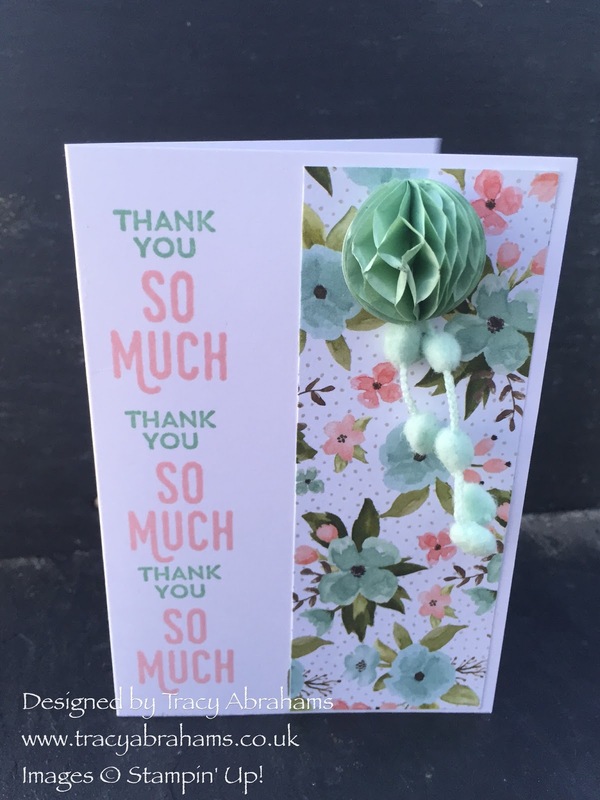 I just love the way this card turned out and I'm sure the young lady it's going to will love it to. Don't forget that the YEAR END SALE finishes on the 4th January ready for the fab new catalogue so don't delay if you want any last minute bargains before they're all gone. I have popped the link to the web page below with all the goodies that are available in the SALE. If you do make a purchase please remember to pop in my hostess code NSQBUK96 to receive an extra Stampin' Up! parcel with goodies in from me, and please leave me a tick in the I would like contact section so I can send them out to you. Have a great day and if you haven't got a copy of the new Spring/Summer Catalogue and would like one please let me know by clicking the subscribe button and I can email you and pop one in the post to you. Every thing in the new catalogue will be available on the 5th January when it goes live so all the products used in this card will be available to buy then..... YAY bet you can't wait !!!!! What will be your favourite I wonder ?? ?